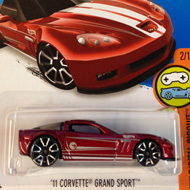 12/250 is a 2016 Treasure Hunt and 2/10 in the X-Raycers series. The translucent green truck sports the low production symbol and a variety of yellow & blue graphics on the sides. The doors have “23” and the sides of the spoiler have the Hot Wheels logo. It has yellow tinted windows, a chrome interior, translucent blue “Y” 5-Spoke wheels with yellow rims, and a plastic Malaysia base. 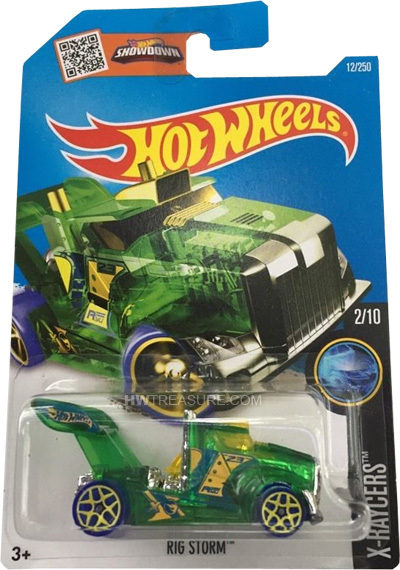 This vehicle can be found in mix “A” of 2016 Hot Wheels mainline cases. The Rig Storm made its debut in the 2014 HW Race series. It is a unique design based upon a semi-trailer truck that has been modified for racing.